This weekend I have been involved in a lively twitter chat about the New Zealand Curriculum and how we can use it to re-engage our teaching community with the front end of the document in particular. The front end is where the principles, values and key competencies are explained. I believe that they were put at the front because we put the first things first, meaning that these are the foundation blocks of all that we do within our curriculum. I believe they are aspirational, broad and challenging, they give us scope to be bold and brave (thanks Wendy for those words) in establishing learning cultures in our schools that support our learners to aim high, think deep, connect and contribute. We are required by law to teach to this curriculum (the whole curriculum not just the AOs), we are required to report against national standards in literacy and numeracy but here's the key thing we are NOT required to teach to the national standards despite what we might be led to believe in some circles. I remember fondly when the New Zealand Curriculum came out in 2007, I was so excited by the wonderful opportunities it opened up. (Yes I am a bit of a nerd to be fair) It made me want to return to the regular classroom but I soon realised that in education we had gotten into a comfortable habit of putting children into 'boxes' and this broad, open curriculum challenged that. We didn't have long before the talk of standardisation started, and then after a while we were given the National Standards. I remember hearing the minister of education at the time telling principals at a NZPF conference that no civil servants had the right to choose what pieces of legislation they adopted and that National Standards were happening and that was that. I returned to the classroom a couple of years ago, Unfortunately I made a dreadful mistake, and to my shame it took me a while to work out why the wheels were coming off for me. You see I felt that as I had been out of the regular classroom (whilst still in education and using the New Zealand Curriculum) I was terribly out of date and needed to focus on what I hadn't been trained with which was, among other things, National Standards. I then felt driven by what was newer to me, due to my sense of inadequacy, but that impacted on my teaching and my engagement with my class. I forgot about the front end of the curriculum in my haste to 'catch up' with and embed things like the National Standards in my practice. In short I lost the educational plot... and the sad thing is that I don't think I am unique in that. I am lucky that I reflected on this and began to reconnect with what teaching and learning is really about and what we are required to deliver in schools in Aotearoa/New Zealand. Oh the relief, the joy returned. 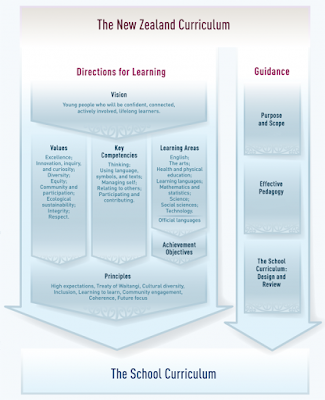 How do we ensure that we are reflecting the vision, values, key competencies and principles of our curriculum? How often do we refer to vision, values, key competencies and principles when we are planning? How often do we talk about the front end of the curriculum with our colleagues? How often do we refer to the front end of the curriculum when we are talking about our learners and their achievements, strengths and needs? I don't have all the answers by any respect but I do have lots of questions and I know there are many more questions I need to be asking. I look forward to continuing the discussion we have begun. I also invite you to join in with the dialogue. We are exploring the option of creating a regular twitter chat to help us stay connected and reignite the enthusiasm and passion there was in 2007 when we were first introduced to our curriculum, we have a very short google survey about this possibility and welcome your input. Hi Meg, I have the NZ Curriculum and frequently look at it. Often missed is the significance of the logo, the nautilus, and what it represents. Growth. Often schools stop at the NZ Curriculum (the "framework") forgetting that it is there to "provide a direction for student learning and provide guidance for schools as THEY DESIGN and REVIEW THEIR CURRICULUM" (P.6). Personalising and expressing the spirit and beliefs of NZ Curriculum within the School Curriculum is the foundation of a healthy school culture. The fruit of this is reflected in the classroom curriculum (where the rubber hits the road :)). Thanks so much for your thoughtful comments Craig, and giving us a another reminder about this cleverly constructed document... yes the nautilus! I think this conversation may be like a nautilus and grow too :) It is exciting. What you are talking about is part of the excitement I felt when the NZC came out in 2007, the potential to shift and change and meet the needs of our communities and learners. Let me know if the Twitter conversation gets going going Meg. It's one that interests me. You hit the nail on the head - "...the potential to shift and change and meet the needs of our communities and learners." The questions parents always ask (consciously or unconsciously) "Where do we fit into your school and how do your school's values align with ours?" It's not just about the kids. It's an entire family that you're bringing on board for 6-8 years. 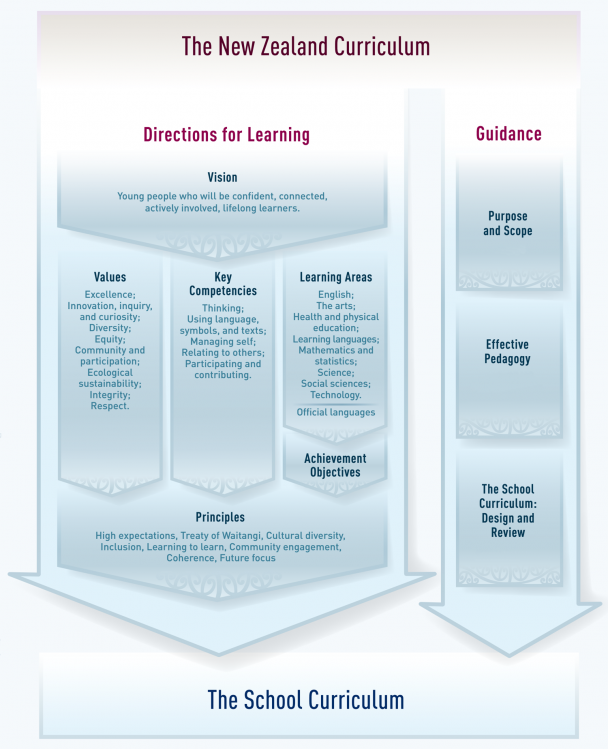 How are the NZ Curriculum principles and beliefs made personal to them?